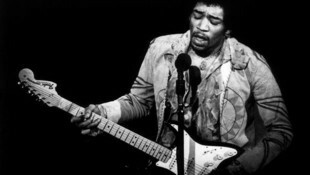 Electro Harmonics is a very large music accessory manufacturer, with products like guitar strings, effect pedals, etc., and...tubes. They have their tubes made by their own specifications, in several tube factories around the world, mainly incl. their own factory in Russia. 1) EH = Standard Series. To read the whole review, simply click below to view the Guitar Player Review of the EH 12AX7: Click here! This is a new production 5U4GB, made by EHX as an exact copy of the 1970's American tubes. .
By the words of the makers, this is an Ultra-long life, top-quality construction, and superior sonics make it the finest 300B available today. That is what they say on their website. My personal experience from selling the 300B-EH-Gold is a little bit different. The tube can have issues, which to my opinion makes this tube what it is: A tube for a reasonable price, with reasonable performance. So I am not negative about this tube, it is just not as ultimate as they say it is. Issues I had with those were: Plates were mounted not on the same height, and tubes were humming. Glass height of a pair was too different. In general these tend to draw lower plate current than Western Electric. So a good 300B draws 60mA. That doesn't mean a 50mA tube is weak, but then it must have higher Gm than normal. (and no they didn't have that). Also it gives me no good feeling to receive always tubes from 48...65mA, and the average was always under 60mA. Also the tubes they send were sometimes four years old. Occasionally you can have a broken heater. Problems always come after the guarantee is over, so you can't complain. It's just a pity, the guarantee is a bit short, only 3 months. All together we decided stop selling this tube. If you want a low cost tube, we have some Sovtek 300B, which is good old quality, from a very old lot. Actually this is NOS, and Sovtek 300B is obsoleted. Yet, price is very attractive. If you want ultimate quality, with lifetime same or better than Western Electric, we recommend Emission Labs 300B. This tube has five years guarantee, of which you get an on-line confirmation by email, after registration. So you can print this email just normally and keep it with your tubes. This KT88 are the ultimate quality KT88 available today from new production. Failure rate is virtually zero, and the matching is done with the double burn in "PL" method. Sextets and Octets cost no extra, but we must have them available. For manufacturers we also can supply a 100pcs bulk pack at OEM Prices. The KT90 can replace the KT88, but it is a different construction tube. The KT90 is made from elements of the big PL519 horizontal sweep tube for color TV's. The PL519 is in fact a tube with very high cathode emission, and it is a really good idea to make a HiFi tube from this. Grids and the plate were modified to make it compatible with the KT88. ATTENTION THIS TUBE IS OBSOLETED - AND I THINK FOR GOOD REASON. There are two versions around, the ELECTRO HARMONIX and SOVTEK. Unfortunately we have to say, the Electro Harmonix was disappointing with vacuum loss, and also the spread in technical data was too much. One charge had data like this, and the other was completely different. Moreover, users prefer always matched tubes, which is hard, because inside one bulb are often two fully different triodes. The factory knows this, and was very quick with refusal to take such tubes back. In the end, what can a dealer do, other than lower his own quality standards. Otherwise he gets stuck with unmatchable tubes. We had often tubes with vacuum loss, or loss of good parameters, simply after being on stock for one year. The factory refuses to take them back, already 12 weeks after we received them. So we had to throw these away. A problem is also, the factory specifies no quality acceptance level. So we had to define our own, but when tubes don't pass they say: Wo do not tell you how to test them. 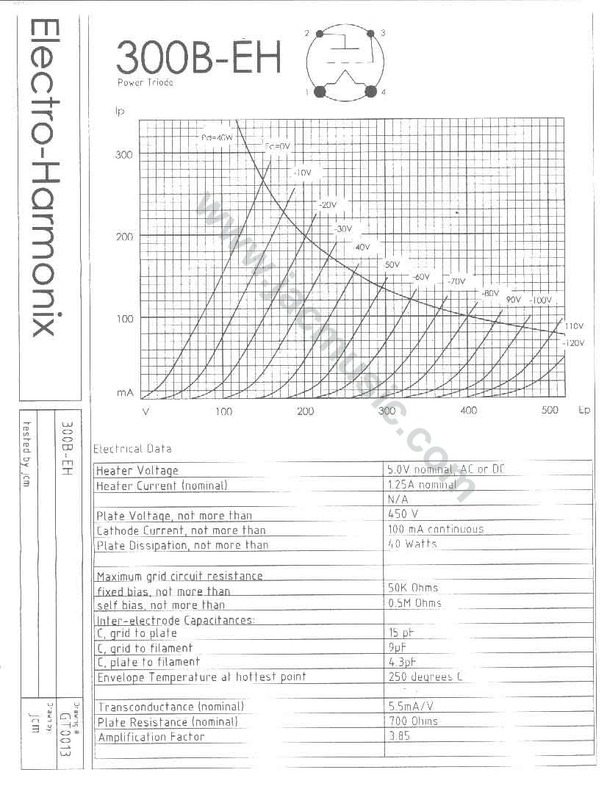 The combination of these problems, was the reason why we do not to offer Electro Harmonix 6H30-EH any more here. As alternative, we recommend the 6H30Pi-Sovtek, that we still have on stock here, as these appear to re-branded NOS tubes, and not new production. 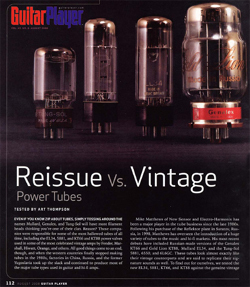 What made me believe so, we had sometimes Sovtek 6H30 branded tubes, and they forgot to remove the Reflektor logo. So I am pretty sure about saying this. 6H30 is widely used today as driver tube in very high ended audio equipment. This tube is also from the best times of Russian military tube making. Actually is was forbidden to export it from Russia, I believe until 1995. It has a very large getter for longest lifetime, and you can best see of this tube as a higher voltage, higher power version of the ECC88. The pin out is the same, also the data are comparable, but is it not fully equivalent. WIth some minor changes (sometimes without changes) you can adapt most ECC88 circuits for the 6H30. Enlarge picture. Modeled after the vintage RCA 6L6GC "black plate," the 6H6-EH features large plate dimensions and improved grid structure for increased power handling capabilities. 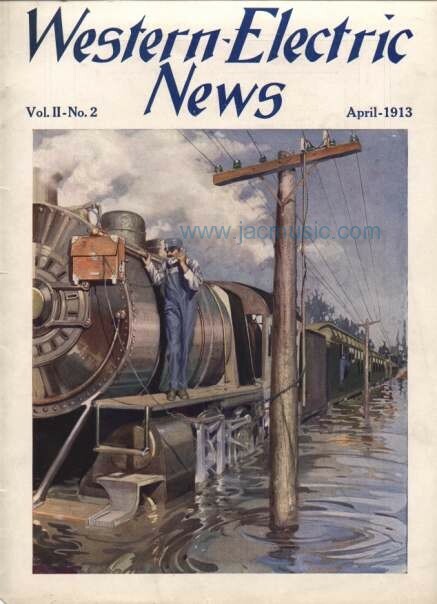 Extra for road amplifiers. Features mica spacers with metal springs to eliminate tube rattle and microphonics. The 6L6-EH offers tone and performance superior to any other 6L6 or KT66 type. High quality 6SN7's have virtually disappeared. We do have some NOS of good quality, but prices start with 30 Euro one. The last years, quality of EHX 6SN7 unfortunately went down to our opinion. We are lucky to have a good inventory still from 2005, which is pristine condition. When this is sold out, we stop selling this type, as newer production does not fulfil our quality standard. It is a pity, but with tubes sometimes this is how things are, we refuse to sell stuff just for having to "sell". So this is a running factory, but we (here at Jacmusic) see large differences between old and new production. By itself this is nothing abnormal, as we observe throughout tube industry, the older the tubes, the better quality they are. So keep apart the date codes of 6SN7-EH that you buy. What means the letter G <== Click there. Must read! This is a fine tube. This tube maintains a linear response while being able to accept a full voltage. Vintage amp users and audiophiles will be thrilled to find that a superior quality, ultra low noise replacement finally exists. GOLDPIN version! For manufacturers we also can supply a 50pcs Qty at OEM Prices, individually packed. This is the GB - Gold-Balanced version. This tube is simply the FINEST 6SN7 available today from new production. It maintains a linear response while being able to accept a full voltage. Vintage amp users and audiophiles will be thrilled to find that a superior quality, ultra low noise replacement finally exists. GOLDPIN version! Semi Long Plate version, with superior dissipation over the originals. Very thick GOLD plated pins. GB = Gold-pin, Balanced tube. Balanced means, both triodes within one tube are identical. Only like this both tube halves will produce the same sound. We do this matching both for plate current, and Transconductance, using official RCA operating points. As a reference we take the balancing information from the 5692. There is no better reference. ( See above). 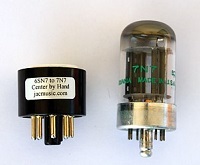 The system balancing was an official part of the original RCA 5692 Data sheet, and it was specified as 2mA maximum difference between two triodes within one tube. We use for the 6SN7-EH-GB a difference of maximum 1.5mA, which is even better than the 5692!. All measured tube data is on the tube box. So before a tube can be called balanced, first both halves must first have the same plate current, and after that have the same Transconductance, within a limit of 0.25mA/V (=250mMhos). It must pass both tests in sequence. Balancing a "GB" pair means: A single tube contains two triodes inside. A balanced pair means you receive two tubes containing actually four identical triodes. Balanced tubes offer uniformity and stability in characteristics, and by this low operating costs. NOS Toshiba. A Telefunken OEM Product? Semi Long Plate version, with superior dissipation over the originals. Perfect for reverb circuits and drivers. This tube has RHODIUM pins, for better contacts quality. Balanced means, both triodes within one tube are identical. Only like this both tube halves will produce the same sound. We do this matching both for plate current, and Transconductance, using official Telefunken operating points. The system balancing was an official part of the original Telefunken ECC801S Data sheet Balancing delta = officially: Max 3,2mA. 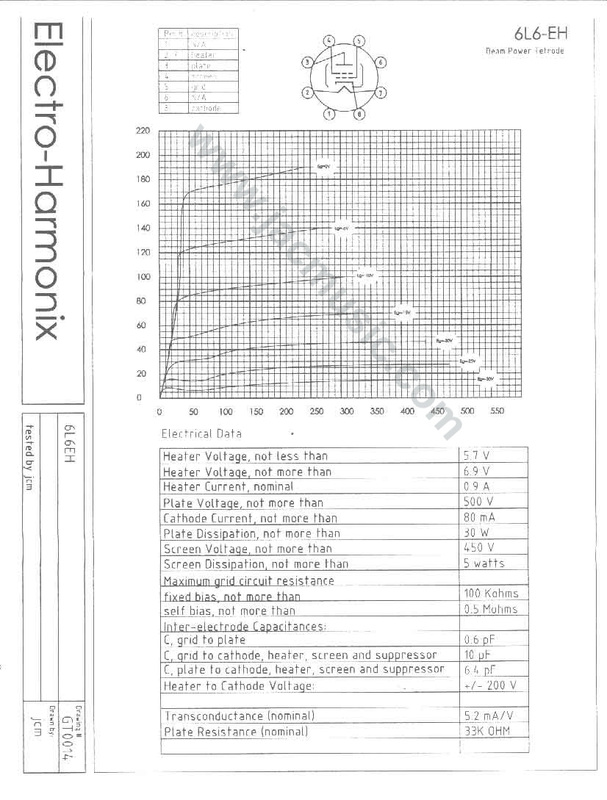 ( See ECC801S Data sheet ) We balance better than original: We use Max 1.5mA. All measured tubes data is on the tube box. So before a tube can be called balanced, first both halves must first have the same plate current, and after that have the same Transconductance It must pass both tests in sequence. The Electro Harmonix tube appears very constant in production, so we could tighten the original specs down from delta=3.2mA to 1.5mA, and enough tubes will pass the test. Balanced means, both triodes within one tube are identical. Only like this both tube halves will produce the same sound. We do this matching both for plate current, and Transconductance, using official Telefunken operating points. The system balancing was an official part of the original Telefunken ECC8021S Data sheet Balancing delta = officially: Max 2mA. 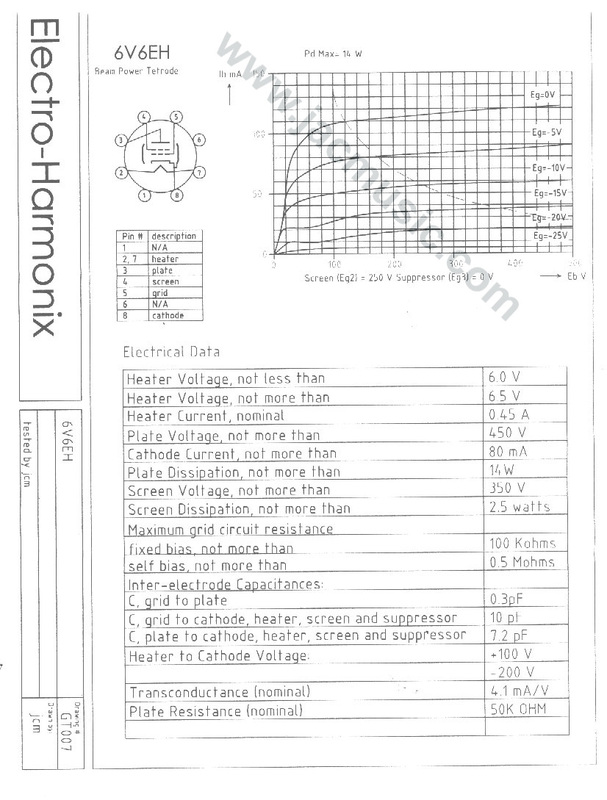 ( See ECC802S Data sheet ) We balance better than original: We use Max 1.5mA. All measured tubes data is on the tube box. So before a tube can be called balanced, first both halves must first have the same plate current, and after that have the same Transconductance It must pass both tests in sequence. The Electro Harmonix tube appears very constant in production, so we could tighten the original specs down from delta=3.2mA to 1.5mA, and enough tubes will pass the test. Balancing a "B" pair means: A single tube contains two triodes inside. A balanced pair means you receive two tubes containing actually four identical triodes. Semi Long Plate version, with superior dissipation over the originals. A fine standard tube. Perfect for reverb circuits, and guitar amplifier circuits with high gain. This tube is specially selected for a darker, "brown sound". So all applications where your amplifier suffers from harsh sound, you should try this tube. Balanced means, both triodes within one tube are close, or identical. This is not always important, but it is important in: Symmetrical circuits, phase splitter circuits for PP amps, and stereo amplifiers where one tube is split over two channels. Only like this both tube halves will produce the same sound. We do this matching both for plate current, and Transconductance, using official Telefunken operating points. 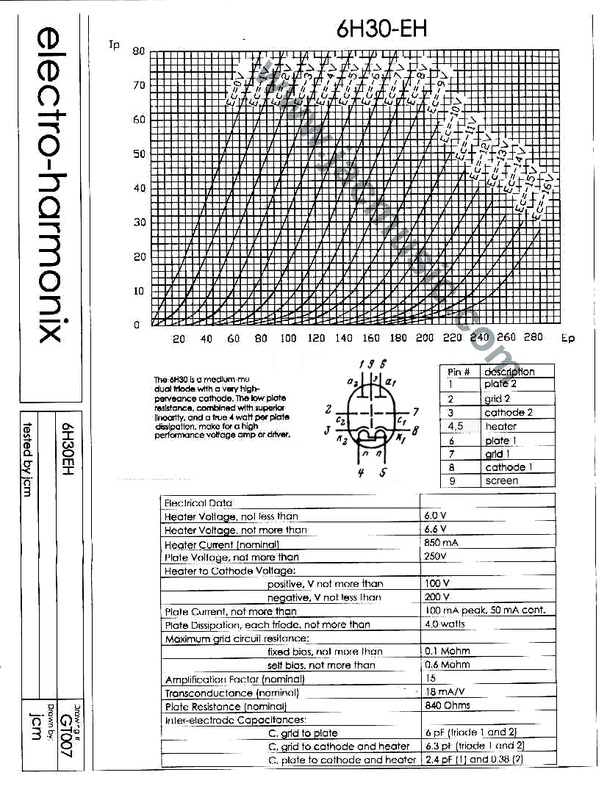 The system balancing was an official part of the original Telefunken ECC803S Data sheet (Balancing delta by official TFK Data sheet = Max 0,15mA). This is extremely tight for this tube, though it can be done. * Balancing a "GB" single tube means: only like this, both halves are guaranteed to have the same plate Transconductance, the same bias and same gain and by this produce the same sound. This matching is done on a computerized test system. *Balancing a "GB" pair means: A single tube contains two triodes inside. A balanced pair means you receive two tubes containing actually four identical triodes. This is a low microphonics, medium gain (40x) twin triode, with 9 pin socket. It is used for first stages in high gain audio amplifiers, where reduction of hum, microphonics and leakage noise are a first consideration. This tube has RHODIUM pins, for better contacts quality. This is a shiny white metal. 5751-EH-G is a low noise, long life version of the ECC83, with gold plated pins. The tube specifications has very small differences compared to ECC83, but this tube is used to replace an ECC83 in all circuits, where you want best reduction of noise an hum. The 6922 is a long life version (10.000 hours minimum), of the ECC88 (6DJ7). B = Gold-pin, Balanced tube. What means the letter B? We use this to indicate the balanced version. Balanced means, both triodes within one tube are identical within a pre-defined limit. Only like this both tube halves will produce the same sound. We do this matching both for plate current, and Transconductance, using official Telefunken operating points. The system balancing was an official part of the Telefunken tubes like ECC802S etc. However, for 6922 this officially was never done by manufacturers. Still we offer it for this tube, because specially with this tube it is more important than with any other audio tube! This is the number one tube where people report sound differences quickly. We use: Balancing delta = Max 1,5mA for the plate current (Static parameter) and 10% maximum difference for the transconductance (dynamic parameter). So before a tube can be called balanced, first both halves must first have the same plate current, and after that have the same Transconductance It must pass both tests in sequence. This tube is a high gain (50x) AND a low voltage (100V) tube type at the same time. These two requirements are very hard to meet AT THE SAME TIME. So this makes it very difficult for the manufacturer to produce those tubes. The question is what will they do with the tubes that are not so good. Good NOS E88CC is almost impossible to buy now, and you have a high risk for fakes when you buy those on Ebay. It is normal that within one glass, you can have two quite different tubes, also with NOS. So very few tubes pass the balancing test. Special ECC88/6922 note for technicians: I think we can say, this is one of the most difficult tubes, if you need a good replacement. If any discussion comes up about about too much noise, or bad sound, it is with this tube. Where does this come from? There are many amplifiers using this tube in so called SRPP circuits. As you know, with a circuit like this, both halves of one tube are put in series, so must draw the same plate current per definition. Problems will come with an unselected tube, where both tube halves by itself actually would have liked to draw a different current. The result of such an unbalanced tube in an SRPP circuit is, both tube halves are in a "battle" about what current they can draw. One of the two halves will try to dominate, and determine the final current for the circuit. The voltages in the circuit are now not correct any more. Also the actual current drawn can be too high or too low, depending if the "higher" or "lower" current tube is the winner. If a stronger unbalance occurs, the circuit will produce more noise than normal and add too much distortion. Also tube wear out can be the result of this, and an acceptable result in the beginning will soon be less good, and the complaints starts from the beginning. To prevent any problems like this, for an SRPP circuit ONLY balanced tubes should be used. This is the most expensive 6922 from EHX, and it has been a troublemaker for us, ever since. So sorry, we do not sell the 6922-EH-GB any more. The parameter variation is unacceptable. Like this we can not seriously match tubes. I am aware others will say "oh sure we can match those" and I believe they say so. Only, we can not do "magic" yet. Also, it is highly recommended to have a look at original NOS 6922. The Philips ECG is amazingly low cost, and it's a real NOS tube. 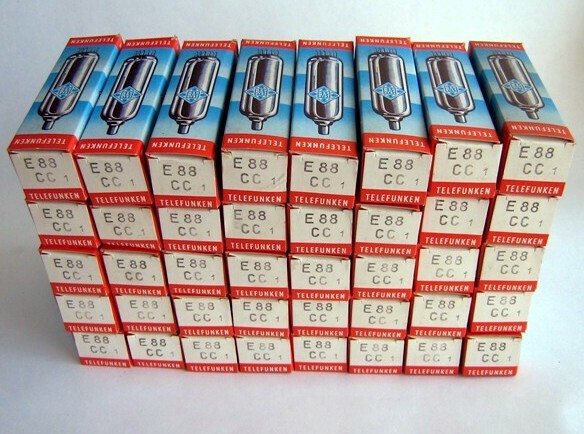 Or, when you want the most expensive, we also have TELEFUNKEN NOS E88CC/6922. Check here. 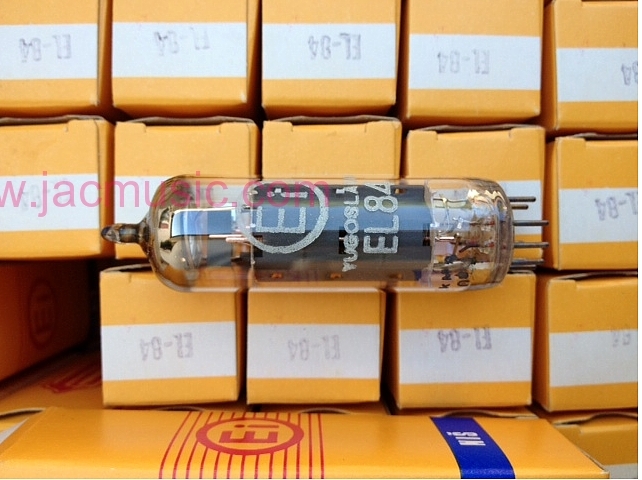 The 6550EH is the finest current production tube for any amp using 6550 or KT88. The 6550EH offers the maximum power of any 6550 with the linearity guitar and bass players want. With 42 watts of plate dissipation in tetrode operation and 44 watts in triode, the 6550EH offers an improvement in power over even the most desirable vintage types including the Tung-Sol 6550 and Genelex KT88. This extra headroom in a 6550EH equipped amp means bass players can finally realize the full dynamic range of the instrument and the sweetest tone available. The extra ruggedness of the 6550EH was engineered with the punishing abuse of guitar amps in mind. The nickel steel side rod mica supports ensure that the 6550EH will hold up in even the most punishing environment of high powered bass amps like the Ampeg SVT and combos where the tube is only inches from the speaker and still deliver the sweetest tone of any 6550 or KT88. The 6550EH will greatly improve the performance of any amp using 6550’s but can also replace the KT88 in any application. Vacuum Tube Valley journal says, "... the new Electro-Harmonix tube comes very close to the sonics of a Mullard EL34, and is balanced throughout the entire music spectrum. Bass goes deep and is tight, mids are sweet and well defined and highs are detailed and extended." Sextets and Octets cost no extra, but we must have them available. The new EL84-EH faithfully recreates the classic Mullard design. Triple laminated plate material and selected screen wire increase thermal dissipation. 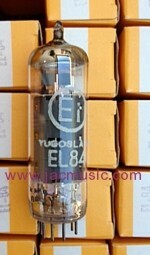 The EL84-EH is a remarkable reproduction of a vintage tube that is capable of maintaining its sweet and musical tone under any voltage conditions. Philips and Telefunken EL84 are the finest and most sought after. EI tubes are made on old Philips tools, after they sold the production line to EI as they phased out production in Holland and Germany. There is talk about these machines are recently destroyed, following a dispute where the new buyer ran into a cost trap. As a result the locals sold it as scrap metal. I do know from ex factory people, the machines got sold to Charles Whitener some years ago indeed, with the intention to produce Western Electric 12AX7, and other types. However he has a track behind him of unfinished projects. So it might well be true what people write in this thread. If so, these tubes will never be build any more. Read the rest here. The Russians had a 10.000 hours version of EL84. I checked the weight of this tube, indeed they are a little heavier. So I believe the anode material is thicker, or it is made of other metals. Normally EL84 anode is made of several layers, including iron, aluminum, and nickel. Western Electric Mobile phone 1913.